Welcome to Galvanised, a century old galvanised iron (of course) shed located in the main street of Millthorpe. 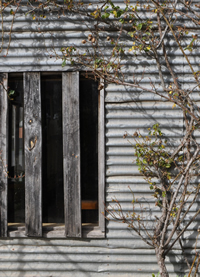 Once used for storing produce for the next-door general store, this classic piece of Australian architecture is now a smart, if quirky, gallery selling a wide range of items that will delight your senses. Linda and Laurie Williams moved to Millthorpe in 2009 and spent a year restoring the shed before opening Galvanised in December 2010. We are now working on a website that will not only tell you more about us, but also allow you to make purchases. In the meantime, here is a gallery of photos to show you what we are and what we sell. Our exterior is much the same as it has been for nearly a hundred years. Here it is during a recent snow fall. Inside, you'll find a treasure trove of quirky, beautiful and yummy things. Cute cast iron animals, candle holders, bird cages, bells, etc., etc., etc. Both our gallery and our website are constant works in progress with a focus on works by our local artists and craftspeople.